It's pretty difficult to remove screws without the correct screwdriver. Our screwdriver kit includes 64 different bits—Phillips, Torx, flathead, and so much more—to cover nearly any screw that you'll find in your device. Feel free to check out our Screwdriver Best Practices guide for some helpful tips. Helpful hint: The Mako kit is attached to a magnetic sheet; pull the Mako kit off the sheet if you need a little extra magnetic space to secure your screws. Specifically shaped for electronics repair, this ESD-safe spudger features a hook for scooping, scraping, pulling, and guiding. Loosen adhesive, flip up connectors, pull cables, or clean out grooves—this spudger allows for a variety of tasks that are unachievable with the standard spudger. The delicate cousins of the spudger are the iFixit opening tools. 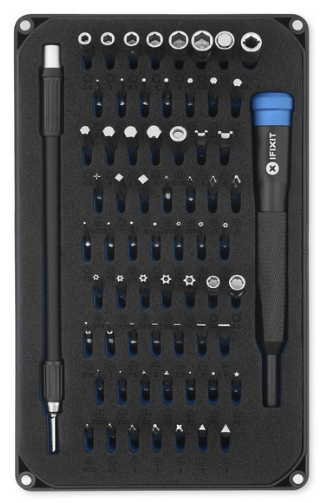 Beautiful and blue, iFixit opening tools are the go-to prying tool when you are especially concerned about scratching or breaking your device. Originally made for iPods, which had tight tolerances and easy-to-scratch outer cases, these opening tools will take a beating so that your device doesn't have to. iFixit opening tools, like spudgers, are ESD-safe and approved for disconnecting cables and ZIF connectors. 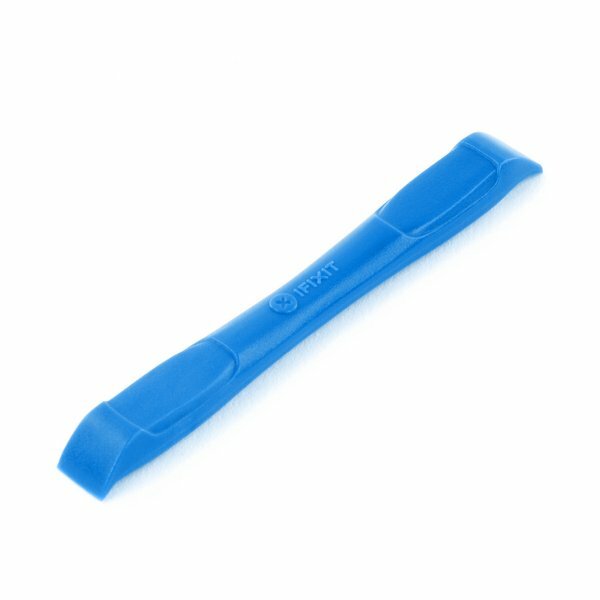 When you need to pry open a device but the iFixit opening tools aren’t enough prying power, the iFixit opening picks can be inserted into the edges of the device to help speed up the process. The picks are incredibly useful for prying open displays and screens. If you just can't seem to wedge your way into a device using the standard array of pry tools, it might be time to phone a friend. That friend's name is Jimmy. Jimmy's flexible steel blade slips between the tightest gaps in the toughest devices, and the ergonomic handle makes it easy to "jimmy" devices open. Spudgers and iFixit opening tools are made of softer materials, and are somewhat less likely to cause cosmetic damage—but when all else fails, Jimmy is your man. Any fixer knows that moment when you're stuck needing that one tool for the job; be prepared for the moment before it hits with this sturdy metal spudger. This spudger is great for when iFixit opening tools and the standard spudger just aren't enough. However, this spudger is not ESD-safe, so only use it as a last resort. The Marlin screwdriver bundle contains 15 fixed blade, precision tip screwdrivers—great for those hard-to-reach recessed screws.